The UK’s coal plant fleet is reeling under the burden of negative cashflows in 2016. Plant closures threaten UK security of supply. Some form of government intervention is expected and the nature of this will shape the evolution of generation margins this decade. The UK government announced in November 2015 that all UK coal plants would be closed by 2025. This was a logical decision in the context of UK emissions policy, and a transition to CCGTs seemed easier in a world of falling gas prices. Few details were provided at the time about how these coal closures would be achieved. But the government certainly did not anticipate that 6 months later, the whole UK coal fleet would be driven to the wall by falling gas and power prices. Since the Nov 15 announcement, 4.3 GW of coal plants have closed. Another 4.3 GW remain on life support in the form of (ancillaries and SBR) reserve contracts with National Grid. And most of the remaining 9GW of UK coal plant are now cashflow negative, suffering from plunging dark spreads. There is also uncertainty hanging over the ‘renewable’ status of biomass units at coal stations which could further exacerbate closures. These events are happening against a backdrop of an historically tight UK system reserve margin. Government support for renewables is steadily delivering new capacity. But because this is predominantly intermittent in nature, new flexible gas fired plants need to be developed to replace retiring coal plants. This is where the UK government has painted itself into a tight corner. New gas fired plants require support from the Capacity Market which has a 4 year delivery lead time. That means as things stand there will not be substantial new baseload capacity until 2020. So the government is in the awkward position of working to close all coal plants by 2025, while critically depending on the same units for security of supply until 2020. The way that this conundrum is resolved is set to drive generation margins and capacity pricing in the UK power market across the next 5 years. A combination of the UK carbon price floor and falling gas prices has done the damage to coal plant margins. The carbon price floor stepped up to 18 £/t last year, against a backdrop of falling gas prices. Falling gas prices mean falling power prices, given UK power prices are set by CCGTs. So coal plant generation margins have been squeezed on both the cost and revenue sides. The impact on baseload clean darks spreads (CDS) can be seen in Chart 1. The sharp gas price decline from Q4 2015 to Q1 2016 has been particularly harmful for dark spreads, which can be seen falling below zero in 2016 in Chart 1. When variable fuel transport and network costs are added in (not included in Chart 1 CDS), the UK’s coal plant fleet is predominantly out of merit on a variable cost basis i.e. power prices are not covering short run marginal costs. 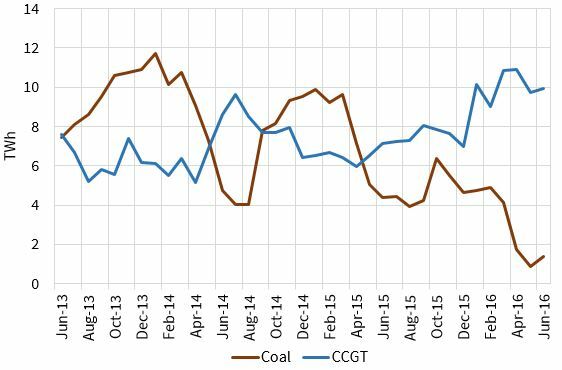 The impact of this can be seen in Chart 2 which shows UK coal generation output plunging in 2016, to the benefit of CCGT load factors. Coal plant economics are undermined by low load factor operation. This is not so much because units are not technically able to operate flexibly, but because coal plant fixed costs are relatively high. Annual fixed costs range from 40-60 £/kW (vs 20-25 £/kW for CCGTs), depending on factors such as locational transmission charges and the treatment of overheads by utilities. Coal plants cannot recover these fixed costs from the wholesale energy market under current conditions. The impact of weak dark spreads is exacerbated by the fact that coal plants incur relatively high starts costs when running at low load factor. This leaves plant owners with the prospect of weathering negative cashflows in the absence of some other source of revenue (e.g. ancillaries or capacity payments). It is these other revenue streams that will likely determine the extent and pace of coal plant closures, in the absence of a recovery in dark spreads. IED constraints: Under EU emissions policy, plants either need to incur capex costs associated with fitting SCR equipment to reduce NOx emissions by 2020 or face run hour constraints. Decommissioning costs: The costs of closing a coal plant is significantly higher than a CCGT and there can sometimes be interesting economic incentives to keep plant open in order to avoid the immediate impact of these. On top of these issues, the 1.7 GW Aberthaw plant in Wales is facing its own unique problems. A European court has ruled against a UK government exemption for Aberthaw NOx emissions which leaves the plant in breach of IED legislation and at risk of closure. The announcement of this last week had a noticeable impact on UK forward power prices, particularly across the coming winter, illustrating how tight the market currently is. In the midst of the uncertainty surrounding coal plant economics, one thing is clear. The UK cannot afford to lose 5-10 GW of coal plants from a security of supply perspective. The government (in the form of DECC & Ofgem) are acutely aware of that. What they appear less clear on is how to prevent it from happening. Life support for coal plants to date has come in the form of Supplemental Balancing Reserve (SBR) and ancillary services contract payments (e.g. to Eggborough and Fiddlers Ferry). But these have been controversial. The government has announced it that the SBR scheme will be discontinued after the coming winter, driven by the adverse incentives it gave coal plant owners to announce closure and sign up for life support. The level of competition & transparency around ancillary services contracts has also been a source of industry discontent. This places an emphasis on the capacity market to keep coal units open. The government’s recently announced additional auction for the 2017/18 capacity year should be sufficient to ensure security of supply until Q4 2018. But pricing in this auction is likely to be significantly higher than the two T-4 auctions that have been held to date, with the clearing price likely to be set by the incremental cost recovery requirement of marginal coal units. The increased capacity targets DECC announced last week for this year’s T-4 auction should help stabilise security of supply from 2021/22. But the 2018/19 and 2019/20 capacity years in between are the problem. Delivering incremental capacity in these years comes down to the year ahead (T-1 auctions). But the government is likely to find it does not have a lot of leverage in procuring capacity at a year-ahead stage. Most coal units already have capacity agreements across the 18/19 and 19/20 years from previous T-4 auctions. These were taken on by plant owners at low capacity prices given an anticipation of much higher dark spreads. The remaining units that do not have capacity agreements for these years are the most economically marginal i.e. the most expensive to keep open (e.g. Eggborough and Fiddlers Ferry). However it should be noted that EDF’s Cottam & West Burton plants have now indicated they will pull out of the 3 year refurbishment agreements they bid for in the 1st T-4 auction. This means they will revert to 1 year agreements for 2018/19 but then be able to bid into the 19/20 T-1 auction. DECC appears to be genuinely spooked about security of supply now. This comes after plenty of industry warning that a capacity crunch was on the way (not least from this blog) and that much of its EMR policy agenda was hindering rather than helping the problem. 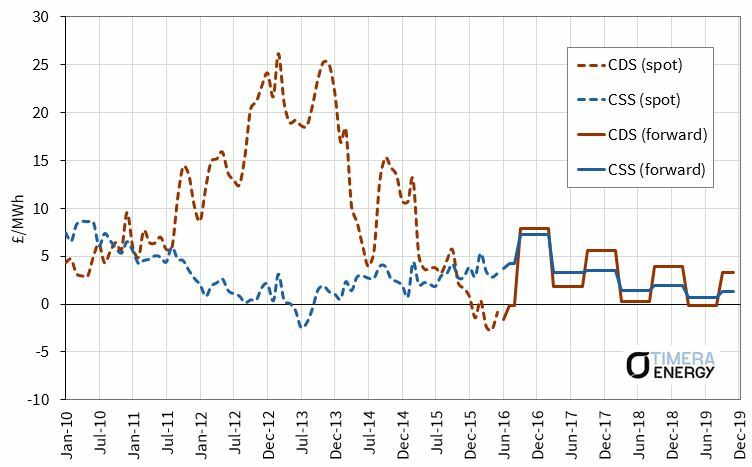 Carbon price floor relief: the scale back or abolishment of the UK carbon price floor could be used to provide some relief for coal plant generation margins. Capacity market tweaks: the government may implement changes to the capacity market (either temporary or permanent) that support existing coal plants e.g. releasing units from existing agreements to bid into the T-1 auctions (although timing is tight for this). Backdoor payments: the government (likely via the TSO National Grid) may resort to support payments for ancillary or reserve capacity, either through existing services or potentially the definition of a new reserve requirement. If the UK government is to maintain investor confidence, it is critical that they handle this well, particularly given the potential impact of Brexit on confidence. Transparency: Openly recognising the problem and engaging the industry to resolve it, rather than trying to disguise a solution via stop gap measures. Price signals: Minimising the impact of any measures taken on market price signals, particularly avoiding any actions that may adversely impact the generation margins required to keep existing plants on the system and support investment in new assets (e.g. by supporting an overhang of uneconomic coal plant in the wholesale energy market). Target the problem: implement specific measures to retain an adequate volume of coal plant to ensure security of supply (without interfering with market price signals). Focus on capacity market: The capacity market has been designed and implemented to ensure security of supply and should be used accordingly as the focus of a solution. Define closure policy: If measures need to be implemented to keep uneconomic coal plant from closing before 2020, they should be done so in the context of a clear policy on closures beyond. The way the government decides to resolve the coal plant problem will impact both the wholesale energy and capacity markets. The policy path chosen is set to define the evolution of UK thermal asset returns across the remainder of this decade. It will also determine the willingness of investors to develop the baseload capacity required to sure up UK security of supply. Fixing the UK’s broken capacity market?